Philadelphia, PA – The National Hellenic Students Association of America revisited the city of brotherly-love this past weekend for their annual 2015 spring convention. 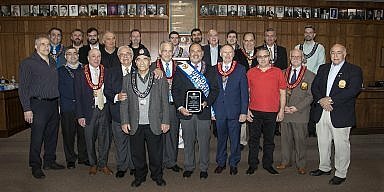 A weekend full of networking, seminars, and participation at the Greek Independence Day Parade were on the program. On Friday evening the students attended a meet and greet at University of Pennsylvania’s International House. 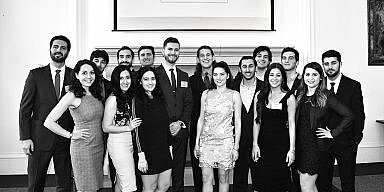 There, three organizations, the Hellenic Medical Society of Philadelphia, the Hellenic University Club and the Greek-American Chamber of Commerce, hosted the students and got to know more about each others organization. Several workshops on Saturday highlighted the morning of the convention. The Greek hospital industry by Dr. Theoklis Zaoutis, MD, (U. Penn) framed a discussion about the current issues Greece is working through in the area of immunization. Dr. Zaoutis has been working closely with the Greek government and the U. Penn to help bring efforts and attention to this crisis. Dr. Robert Zaller, PhD, gave a lecture on Greek Independence and tied together its significance as a war of independence in addition to the American and French Revolution. Dr. Zaller is a member professor of history at Drexel University and a contributor to many publications around the world. Students participated in a basketball contest late in the afternoon, sponsored by the Philadelphia Greek Basketball League. Later that evening, students attended a dinner sponsored by the Federation of Hellenic Societies of Philadelphia and Greater Delaware Valley. There, they saw AHI Foundation President, Spiros Spireas receive the Eleftheria Medal for his continued efforts to promote and perpetuate Hellenism. The NHSA guests, then went out to local Greek restaurant Savas Brick Oven & Bar, where a late night of Greek music and dancing went on by local Greek band Seizmos. 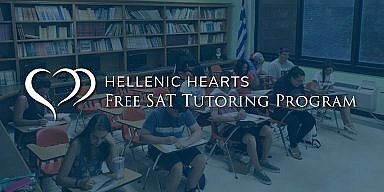 Sunday brought together many Hellenic clubs from a variety of Universities across the Philadelphia metropolitan area. Joining with their academic brothers and sisters, the NHSA students marched along side them in the Greek Independence Day Parade. Following the march, they joined the Hellenic clubs for lunch. Full of activities, lectures, workshops, they got to also know the Greek community of Philadelphia. In all, the students who attended the weekend in Philadelphia were given a Hellenic Philadelphia style welcome that will surely be remembered.